Saudi Arabia is the world’s largest producer and exporter of oil, and has one quarter of the world’s known oil reserves – more than 260 billion barrels. Most are located in the Eastern Province, including the largest onshore field in Ghawar and the largest offshore field at Safaniya in the Arabian Gulf. Saudi refineries produce around 8 million barrels of oil per day, and there are plans to increase production to around 12 million barrels per day. As the world’s largest producer and exporter of oil, Saudi Arabia plays a unique role in the global energy industry. Its policies on the production and export of oil, natural gas and petroleum products have a major impact on the energy market, as well as the global economy. Mindful of this responsibility, Saudi Arabia is committed to ensuring stability of supplies and prices. The Kingdom has repeatedly acted in times of crisis – such as the Gulf Crisis of 1990-91, the 2003 Iraq war and market fluctuations of the late 1990s – and covered any drop in oil supplies by increasing its output. In this way, Saudi Arabia has prevented major shocks to the global economy from a loss of supply or sharp price increases. The story of Saudi Arabian oil goes back to 1933 when King Abdulaziz bin Abdulrahman Al-Saud granted Standard Oil of California (Socal), later renamed Chevron, the right to prospect for oil in the new Kingdom. In 1938, Socal discovered large quantities of oil in the Dammam Dome near the Arabian Gulf. Limited exports began in 1939, and picked up significantly with the end of World War II. In the late 1940s, Socal entered into a consortium with other American oil companies and was renamed the Arabian American Oil Company (Aramco). 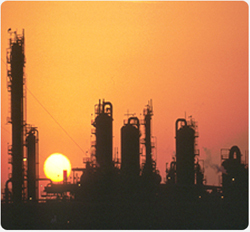 By the 1970s, Saudi Arabia had become the top producer and exporter of oil in the world. The Saudi oil industry entered a new era in 1980 when the government assumed full ownership of Aramco, renaming it Saudi Aramco. The company began exploring in areas that had previously been untouched, and discovered vast deposits of high-grade crude oil. Saudi Arabia continues to find new fields – such as one discovered 175 miles southeast of Riyadh on April 20, 2005.